This is one of my favorite fall crafts. Go outside and gather leaves. They need to be fresh for this craft because they’ll need to contour to the shape of your bowl. Allow your kids to pick the colors and shapes they want to use. However, note that some leaves are better for this project than others. I used leaves from fruit trees, hackberries, sumacs, and currents. Leaves that probably won’t work well are anything that’s too stiff, like oak leaves, or leaves that are too large to confirm to your bowl, like large maple leaves (unless you want to make a large bowl!). Set up a craft table with all the supplies listed above. Cover the outside of your bowl with Saran Wrap then turn the bowl upside down on the table. You’ll be building your leaf bowl on the outside of your real bowl. 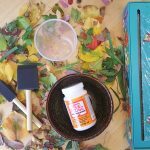 Using your brush, brush some Mod Podge on the Saran Wrap – about the shape of your first leaf. Place your leaf on the glue, then Mod Podge over it again. NOTE: If your leaves have a softer-colored underside, be sure to place the colorful side down, facing the bowl. This way, when you’re done, the inside of your bowl will be as colorful as the outside. Do this process over and over (glue, leaf, glue) until you have a single layer of leaves around the bowl. The glue looks white when it’s wet but it will dry clear. 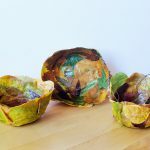 Cover the layer of leaves with Saran Wrap, trying to make sure that it’s relatively flat and fits the form of the bowl. Allow it to dry over night. The next day, slowly peel the outer layer of Saran Wrap off. The glue will still be sticky and may cause the leaves to stick to the Saran Wrap so peel it off slowly. Then add another layer of leaves. NOTE: If your leaves have a light color on the underside, this layer is when you’ll turn the leaves over so the bright color is facing you. This will be the outer portion of your bowl. Make sure all the spaces have been covered. Allow the bowl to dry overnight. If all the spaces between leaves aren’t covered, then add another layer. If you want the bowl to be really strong, then add another layer. Once you’re happy with your bowl, allow it to completely dry by letting it sit for a couple of days. Once it’s dry and firm, peel the outer layer of Saran Wrap off and then take it off your bow. Slowly peel off the Saran Wrap that layers the inside. Put one final layer of Mod Podge on the inner and outer sides of the bowl and let it sit over night. Now you have a beautiful leaf bowl that you can actually use! Use it to store candy or hold your car keys! These bowls are hardier than you think! We’ve been using one now for 3 years to hold our car keys! The hardiness depends on the type of leaves used, the amount of glue used, and the number of layers of leaves. But, if your bowl breaks, don’t worry. You can make these anytime there are leaves on the trees! We’d love to see how your craft project turned out! Join the Facebook group Nature Challenge and post a picture for us to see! Your pictures help encourage other parents to get outside with their kids and create beautiful art with nature! How to Make Leaf Garland: A Fall Craft that’s Perfect for Kids!